To the surprise of absolutely nobody, the videos purportedly showing off the interface of Apple’s forthcoming Snow Leopard operating system have been removed from YouTube. 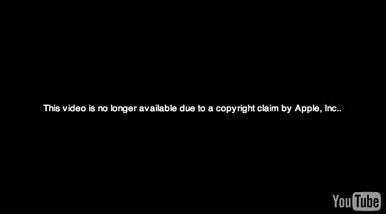 While one of the videos has a message explaining that it was removed due to a copyright claim by Apple, others appear to have been removed voluntarily by the user, who goes by the name LeopardOctober. If nothing else, though, the copyright claim by Apple pretty much assures that these were in fact shots of the Snow Leopard interface—at least, at some point. Of course, there’s no guarantee that all these features will be in the final release, nor that they will function exactly as depicted here. For those of you who didn’t catch the videos while they were available, we counsel patience. Snow Leopard is expected to be a highlight of WWDC, which is a mere three weeks away. Soon enough, we shall all know the mystic secrets that lurk deep within the heart of the snowiest of leopards.